Ok, there has been a lot of controversy on these books, especially now that the movie just came out last week, so I decided I should tell what I think about them. The Hunger Games by Suzanne Collins is about a girl named Katniss, who lives in the remains of the United States (it is in the future). Each year, the government chooses two people from each district. Then, they are put inside a huge habitat with many dangers that they have to keep themselves alive through. But the biggest danger is they people around them- to win the game, you have to kill everyone else and be the last one alive. If you win, your family gets food for the rest of their lives. I think my opinion is that some people are able to read them earlier than others. It definitely depends on the maturity level, but I think that people under 6th grade absolutely should not read the books, and after that, it is solely the parents decision. Buy The Hunger Games here. Buy or rent the movie (which is super good!) here. Buy or rent the second movie, Catching Fire, here. P.S. This book is written by the author of The Underland Chronicles, a great series for 6th to 7th graders. Thanks for the tips on the book(s) Audrey. I will remember these when I start 6th grade or when I’m older. I loved these books and reviewed them last fall. I agree, though, they aren’t appropriate for everyone. I won’t let my kids read them till high school (14). Good review, Audrey. I might add: the level of violence, death, scary stuff, and romance is more along the lines of Harry Potter than it is, say, the Twilight Series. Nice job Audrey! You do such a great job on these reviews and I hope you continue to thrive in what you are good at! Keep it up! Hi Audrey! My name is Stella and I am going into 6th grade. I LOVE to read. I went to FCA when you were there :-). 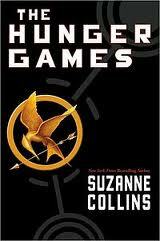 I am not aloud to read the Hunger Games yet, but my all-time favorite series is The Underland series by Suzanne Collins. Have you read them? One of the sixth graders at FCA told me about the series… my new FAVORITE books!!! They would make a great movie!